‘The Conjuring’ Is A Modern Throwback To A Time When Ghosts Were Loud And Movies Were Terrifying. “Before there was Amityville, there was Harrisville.” So states the promotional push for The Conjuring, the based-on-a-true-story spook film from director James Wan (Saw, Insidious). The film is the story of the Perron family, Carolyn (The Haunting‘s Lili Taylor) and Roger (Ron Livingston from Office Space), and their five daughters who move into their dream house in the early seventies. The dream quickly turns into a nightmare when they begin to experience strange phenomena in the house, ranging from harmless noises to full-on violent assaults. Carolyn reaches out to Lorraine and Ed Warren (“Bates Motel”‘s Vera Farminga and Patrick Wilson from Watchmen), a renowned husband-and-wife team of paranormal researchers. As the Warrens investigate, they realize that the Perron’s home is haunted by much more than just typical ghosts – there are dangerous entities inhabiting the Perron home, and they have latched onto the entire family. It’s up to Ed and Lorraine to rid the family of the demons before any permanent harm is done. 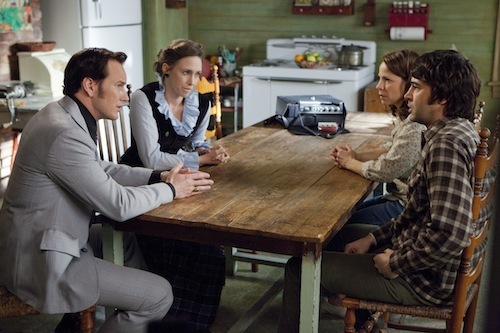 Although the phrase “based on a true story” is attached to just about every horror film produced in the modern era, the claim is factual in the case of The Conjuring; the story is based on the actual case files of Ed and Lorraine Warren, and Lorraine worked closely with James Wan and screenwriters Chad and Carey Hayes (House of Wax) on the film. Culled together from pieces of the Warren’s memoirs about the haunting, parts of the story are so unbelievable that it’s difficult to tell what may be real and what may be exaggerated. Nevertheless, The Conjuring will engross, entertain, and scare the pants off of any audience, true-believer or skeptic. Harkening back to classic haunted house movies like The Amityville Horror and The Haunting, The Conjuring has a very retro-horror vibe. Despite its R rating, there is hardly any blood, guts or gore in The Conjuring; it doesn’t need it. It’s terrifying, and doesn’t need to eviscerate any characters to prove it. Visually, the film is photographed much like Wan’s Insidious (Wan even used Insidious cinematographer John R. Leonetti) with a nice mix of long, Altman-esque tracking shots and short little cuts that keep the retro film from feeling old – it becomes a throwback to, instead of an imitation of, seventies ghost movies. Between the suspenseful script, the talented cast, and Wan’s experienced direction, The Conjuring works incredibly well. Like most horror movies (or most movies in general), The Conjuring has a definite arc to its story. It gets to a point in the third act when it stops being creepy and just becomes thrilling – there’s no subtlety to the climax, just a non-stop roller coaster ride. While it doesn’t completely derail the narrative, it does change the spooky vibe that has been built up for the first three-quarters of the film. It becomes less of a ghost story and more of a…not-a-ghost story. However, even with the change in tone, The Conjuring never gets boring or tedious, and is still one of the best haunted house movies in recent memory. Much of what makes The Conjuring so effective is the skillful work of sound designer Joe Dzuban (Insidious, The Devil Inside). The spirits and demons in the house make their presence known through noises, and there is plenty of bump-in-the-night to show the characters (and the audience) that they’re there. What sets The Conjuring apart from other haunted house movies is Dzuban’s use of silence; it’s what is not heard that is most horrifying. While the inevitable thud or clap will eventually sound, the anticipation that the viewer feels is almost more rewarding that the bump itself. The buildup is so well done that the knockdown is flawless. The Conjuring also features an incredible musical score by Joseph Bishara (Insidious, Dark Skies). Bishara’s soundtrack is perfectly schizophrenic, going from a cacophonous wall of dissonance one minute to a subtle, sparse piano theme the next. The dynamic score only adds to the suspense and tension that is already neck-deep in the film and it becomes impossible for the audience to get too comfortable while the music is playing. Between Dzuban’s airy sound design and Bishara’s menacing music, viewers can’t even close their eyes to get away from the horror; The Conjuring is in their ears as well. The entire mood of The Conjuring is set up by the little details in the film. James Wan and production designer Julie Berghoff (Saw) go to painstaking lengths to make sure that everything in the movie is freaky and creepy. The artifacts and relics that are found in the film are the stuff of nightmares. There’s a horrifying possessed doll that is the scariest children’s toy since the clown in Poltergeist. 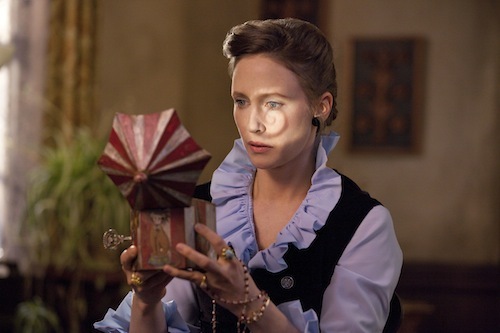 The youngest Perron daughter finds a music box with a mirror in which one of the ghosts will only appear, and it makes for some seriously tense moments waiting for him to show up. A wardrobe that is left behind in the house and used by the family provides added suspense as humans and specters alike slip in and out from between the clothes that are inside it. And that’s not even mentioning the basement, a hidden room filled with cobwebby furniture and forgotten items, each one seeming like it could tell a story worthy of its own movie (including, of course, a spooky piano). Unlike the houses in The Amityville Horror and The Haunting, the Perron home does not become a character in and of itself, but its contents provide a ghastly playground for the spirits in The Conjuring, and everything looks so morbid that one has to wonder why the Perron family moved into the house in the first place. Everything about The Conjuring is scary. James Wan subscribes to the less-is-more school of horror, and the horror lies in what he doesn’t show. Wan builds up maddening suspense in a manner that is similar to the Paranormal Activity movies; audiences know that something is going to happen, and they know that it’s going to be scary, they just don’t know what or when. In proven monster-movie fashion, Wan exposes his ghosts and demons slowly. The viewer is driven mad watching the mirror on the music box, waiting to see what is going to appear. Likewise, when the little girls are playing Hide & Clap (a game similar to Hide & Seek in which the hiders clap when the seeker requests) the viewer is never sure whether the clapping is coming from one of the girls or from something else. The Conjuring keeps the audience on the edge of its seat, building up so much tension and suspense that looking away is impossible. Then the thud comes, followed by the screams.